The manufacturer, Rome Industries, is based in Peoria, Illinois and has been producing nostalgic style solid cast iron cookware in the same manner since 1964. Don't let the fact that they are cast in China lead you to believe they are not of high quality. Rome Industries is highly respected in the cast iron cookware market and offers a full 5 year warranty on this product as well as most all of the cast iron cookware they produce. That being said, please note: These waffle irons are marketed "as cast", which means Rome Industries does not intend for them to have the appearance of a carefully crafted and finished piece of cookware. The outside edges of the waffle iron are intentionally left somewhat rough and you can clearly see where the excess cast iron from the molding process was removed and roughly ground down. The goal is to remove any sharp edges that might harm the end user but no attempt is made to grind or polish away all of the remnants of the casting process. This is the way cast iron cookware used to be cast. It was only processed and finished enough to become a wonderfully effective piece of cookware. The only portion of the waffle iron that is carefully smoothed and de-burred is the cooking surface where the waffle itself is made. It does not matter that the outside edges of the waffle iron are not finely ground and polished. It still makes a great waffle, assuming you follow the included instructions carefully and as with all cast iron cookware, it must be properly cleaned and seasoned before it can be used. 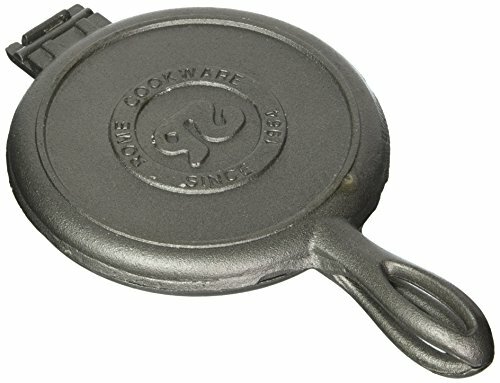 This is a small, compact, solid cast iron waffle iron designed for easy storage in an RV or camper or to throw in your backpack and take along on your next camping trip. Approximately 6 ¾ inch diameter cooking head (makes 6 ½ inch waffle) and 11.25 inches in overall length including the handle. As with most cast iron cookware, you must remove the factory wax coating (prevents rust) AND it must be properly seasoned before its first use to prevent waffles from sticking, detailed instructions included. This design works best on a gas camp stove or a home gas stove. Full 5 year manufacturer's warranty, but with basic care should last for generations. Rome Industries headquarters are in Peoria, Illinois and they have been making cast iron cookware since 1964. This waffle iron has been cast at the same small family run foundry in China for almost 20 years. If you have any questions about this product by Rome's Original, contact us by completing and submitting the form below. If you are looking for a specif part number, please include it with your message.